The Buffalo Sabres weekend could spell the end to their historic run! As a fan of the Buffalo Sabres I am extremely disappointed with their play this past weekend, we played two crucial games in which we should have taken home at least 3 points. But instead we ended up getting no points this weekend, which puts us 2 points behind the Washington Capitals for the 8th and final playoff spot with three games remaining! It’s starting to look really bleak in Buffalo. 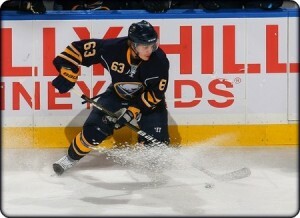 Over the weekend the Buffalo Sabres lost 5-3 to the Pittsburgh Penguins and 4-3 to the Toronto Maple Leafs. Yes you read that correctly the Sabres lost to the lowly struggling Leafs! The Sabres have really put themselves behind the 8 ball by losing both these games on the weekend; The best case scenario for us making the playoffs is to go 3-0-0 and have washington go 1-2-0. Looking at the schedules it would be possible for the Caps to do what we need, as they face the Lightning, Panthers and Rangers in their final games. But it would be more of stretch for the Sabres to go undefeated as they face the Leafs, Flyers and Bruins, the final 2 games on the road. Let’s dissect the two games in which the Sabres lost this weekend, although both seemed rather close there is more to look at than the score! As I posted in my blog on Saturday this game can and will likely end up being a defining moment in the Sabres season. To be honest I kind of figured the Sabres would end up losing the game, but I was hoping they would be able to scratch and claw out a point. Pittsburgh had just lost back to back games against the Islanders, and were going to be amp up for this game, not to mention they had Sidney Crosby back in the lineup joining the already dangerous Evgeni Malkin. When you examine all the facts and the evidence you know that the Sabres are going to be the under dogs in the game. But what I wasn’t expecting, was for Miller to have such a rough game; a .879 save percentage and 4 goals against (1 was an empty netter) is not acceptable for a team that is desperately trying to make the playoffs. I was hoping that Miller, would be on his game like he has been over the last 2 months helping the Sabres go 14-2-3 and take the East by storm. But at the same time, a goalie who has been as hot as Miller and put his team on his back over the last stretch does deserve to have a little bit of an off game and still expect his teammates to help him, sadly that didn’t happen. But non the less the Sabres lost 5-3, Miller was shaky and had some rough rebounds, Crosby shined, the Sabres tried to tie it but it was too little to late and the Sabres lost their first game in 5 games. Did I mention Marc-Andre Fleury wasn’t in net? Brent Johnson was in net and was making his first start after missing the previous 19 games due to injury. 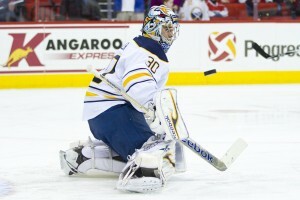 Even though the backup goalie had a bit of a rough game, the Sabres failed to really capitalize. This game seemed to be closer right? Wrong! Although the game ended in a one goal game, it was far from a close match up for most of the game. The Sabres came out flat, just about as flat as you could be! They were losing battles for pucks, missing passes, turning over the puck, and couldn’t hit the net! I don’t know if the Sabres were just to confident going into this game or what, but the team that started the game, was not the same team we’ve seen the last couple months! It was strange I had a really bad feeling about this game, Toronto had been embarrassed time and time again at home over the last few weeks, hadn’t won a home game in 54 days, hadn’t won a home game under new coach Randy Carlyle and had both starting goalies hurt, yet I was still worried. Games against the Sabres, always tend to bring out the best in the Leafs, even when the games have no meaning for the Leafs, they always seem to grind out a win, not to mention Carlyle would have likely lit a fire under their butts! Sadly Toronto just came out with more jump than the Sabres did to start the game, despite having the first 3 power plays we couldn’t capitalize or hit the net. It was really sad we weren’t able to get more shots on the Leafs net, as they were starting their AHL goalie Ben Scrivens who might have caved if we were able to hit the net and make solid passes. But we do have to tip our hats to Scrivens who stopped 29 of 32 shots for a .906 save percentage, not bad for an AHLer! The lone bright spot for the Sabres was the Tyler Ennis Line! Which continued their scoring touch; Drew Stafford had a goal and an assist and Ennis also had a goal and an assist plus an assist for rookie Marcus Foligno, this line is hot and shows no signs of letting up! This loss is a major blow to our playoff hopes!End result; 0 points………….. what I was expecting 2 pointsNeedless to say this was a rough weekend for the Sabres who walked away with 0 points! Anytime you lose to two backup goalies especially one who’s been playing most of his career in the minors, it’s never a good thing. What made the weekend even worse was the Capitals winning their game in a shootout giving them back their 2 point lead the had about a week ago, who knows if they’ll be giving it up as easy again.The Sabres now have their work cut out for them as they need to finish with more points than the Capitals to make the playoffs, a tie will be no good! It’s looking more and more likely that the last game of the season will be the deciding factor for this Sabres team! But here’s the kicker, this Sabres team (with the exception of Ehrhoff) is the same team that went 14-2-3, the same team that went out West and shutout Anaheim and San Jose, that beat the Canucks, the same guys are on the ice. So let’s not bet against the Sabres odds! Was this 14-2-3 run just a cruel tease or something legitament that fans can look forward to, we’ll find out within the next week one things for sure Ryan Miller will need to be on his A game. Will the Sabres make the playoffs…. My heart says yes but my brain says no!